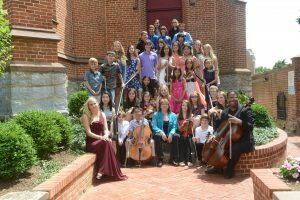 MDTEC is now accepting beginning violin and cello students! If you have a child between the ages of 5-7, now is the time to start violin or cello lessons. Beginning violin students have a 30 minute private lesson and a 30 minute group lesson each week. In addition, home practice is made easier through the use of ViolinPractice.com, an online support system that features guided practice videos. If you are ready to start on this amazing journey with your child, please contact Phyllis Freeman, MDTEC director. Students who have already received instruction elsewhere will also need to schedule an intake evaluation assessment. Intake evaluations are 30 minutes long and there is a $40 charge which is paid at the time of the evaluation. After the evaluation, parents will receive an email which will give suggestions and recommendations for the student. An intake evaluation does not guarantee acceptance into MDTEC. Students will be accepted based upon their willingness to work diligently and their compatibility with the MDTEC curriculum. Students may request specific teachers, but placements with a specific teacher cannot be guaranteed. To schedule observations or evaluations please contact Phyllis Freeman, MDTEC director. Beginners: Students may begin violin or cello at the age of 5. We do not accept any beginners on violin who are older than 10 or cellists who are older than 11. We do not start beginners on viola. Potential violists start on violin and then add or switch to viola in their teen years. Siblings of current students will be given priority for placement. Students may begin studies at anytime during the year, but the beginning of the fall semester is preferred for a starting time. Parents must be present at both the group and private lessons, take notes and guide the practice at home. Instead of purchasing sheet music, beginning violin students will join ViolinPractice.com to access videos, sheet music and tips for helping with home practiing. Continuing Students: All violin students are required to participate in a weekly group class in addition to their private lessons. This is in effect until the student has completed the 8th grade (14 years old). After the 8th grade, they may elect to continue with group class and/or fulfill their ensemble requirement by participating in a youth or school orchestra.